Liam Dunne has teamed up with Ballinteer St John’s for the coming season. Former Wexford manager Liam Dunne is now coaching the senior team at Dublin club Ballinteer St John's. FORMER WEXFORD MANAGER Liam Dunne has taken on a new challenge for the coming season with Dublin club Ballinteer St John’s. 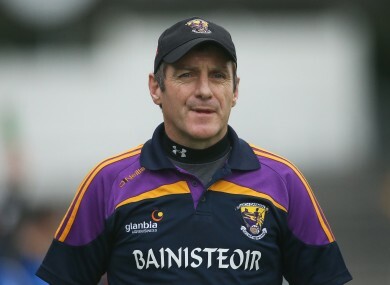 The Model County legend’s five-year tenure as Wexford boss ended last season and Davy Fitzgerald was appointed as his successor last October. Oulart-The Ballagh man Dunne is now keeping himself busy with Marlay Park-based St John’s, who had a disappointing season in 2016 under former Kildare manager Brian Lawlor. St John’s were relegated from Division 1 last season but retained their senior ‘A’ status following a relegation play-off victory against St Pat’s, Palmerstown. That came on the back of heavy round-robin defeats at the hands of club All-Ireland finalists Cuala, Kilmacud Crokes and St Vincent’s. Dunne, a three-time All-Star and All-Ireland winner in 1996, brings vast managerial experience to Ballinteer, at club and county level, having coached Oulart-The Ballagh to three successive Wexford titles from 2009-2011 before taking charge of the Model County senior side. Email “Former Wexford hurling boss takes reins at Dublin club”. Feedback on “Former Wexford hurling boss takes reins at Dublin club”.